Wonderful silvery-green succulent leaves. 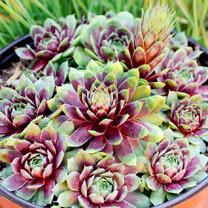 The inner "heart" of the houseleek turns a ruby red as it matures. Flowers July-September. Height 1-10cm. Supplied in a 9cm pot.